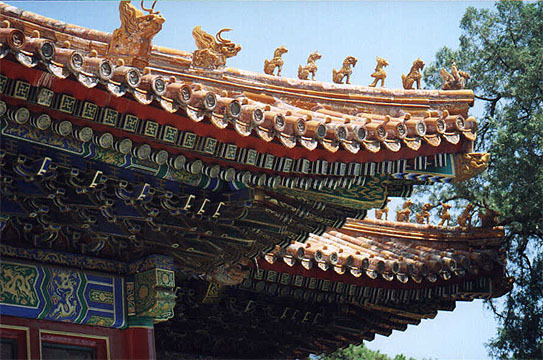 On the corners of the eaves, there are animal-nails to fasten the tiles. These animal-nails were carved into mythical animals (dragon, phoenix, lion, etc.) to ward off evil spirits. The number of these animal-nails signifies the hierarchy of the buildings, the more, the more important. The number of such nails is always odd, ranging from none to nine. The only exception is the Hall of Supreme Harmony. As you can imagine, it has the most and is even, twelve.